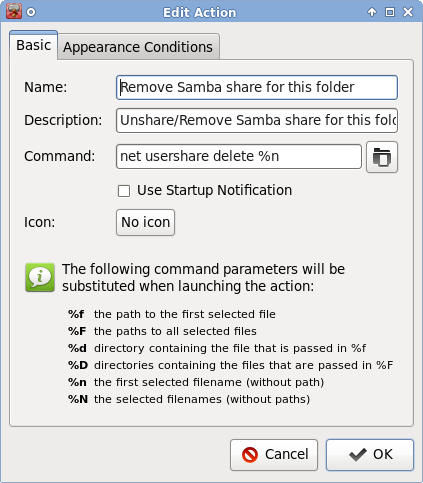 Since I use XFCE4 I was searching a easy way to temporarily share a folder to another PC over the network. 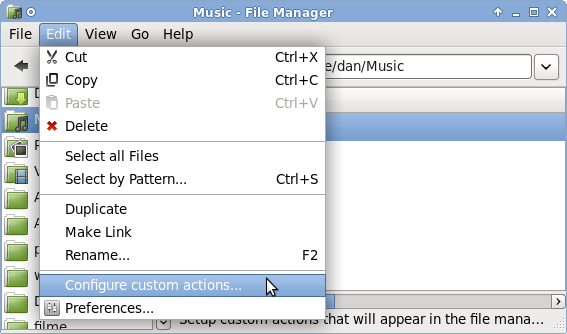 Gnome have a nice and easy way of doing this with a right-click on a selected folder. But for XFCE there is no such option available. But to fix this you have to create a “custom action”. 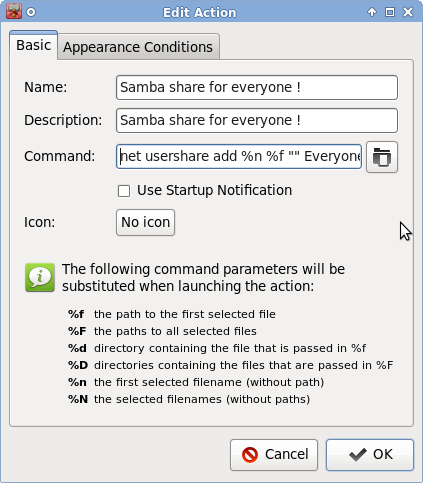 Note 1: Samba must be installed for this method to work ! Note 2: I tested this solution on Mint 13/XFCE 64bit. It should work also on Ubuntu 12.04 and higher or similar Linux distros. Notice: copy the above command as it is. 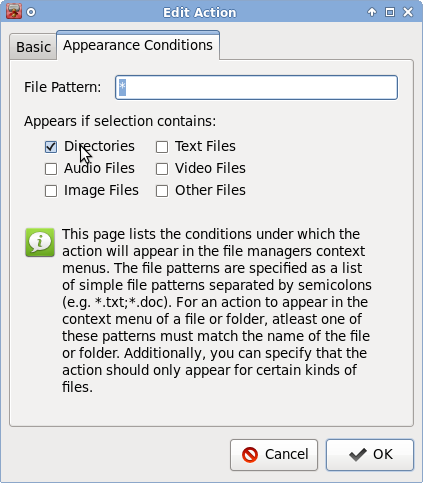 The shared folder will have the same icon (not like in Gnome with the special “share” folder icon). Go on “Appearance conditions” tab and there click only on Directory and remove all the others. The main idea is to see this “share” option only if you selected a folder. On the “appearance condition” tab select Directory only. Step 3: test the new created menu. To unshare (not share publicly the folder) you have to make right-click on the same folder but choose the second menu with “unshare”. In few seconds the shared folder will not be publicly available. It is preferable to use for this a empty folder since it may be dangerous to give 777 permission to everyone. The commands described above can also be run in terminal but you have to replace the %n, %f with the correct values. See above pictures for details. I have a new HDD from Western Digital. It is a WD30EZRX Caviar Green. It has 3TB and the price is almost ok. The disk works fine for now so I will detail the way the partition can be done in Linux/Unix. Why do we care about this ? Well.. because this 3TB is bigger than normal HDD on the market. The forums are full with people asking why do not see the full 3TB size . Well there are some issues with the way the data is addressed. It is nothing wrong with the disk but with the software used to see the partitions or to access the partitions. In my case I used a old external HDD enclosure to test the drive. It was out of the box, so I was thinking to partition it and then to be screwed in the final rack. Wrong ! Since my HDD enclosure ( cheap and old case with JMicron SATA-to-USB interface) is accessing the data in 32bit format (hex) the max visible disk size was 746MB. I searched the web and I found many guys complaining that they see the same 746MB size in the 3TB disk. But other people were saying that they see 2.1-2.1TB !?! Well… after aprox 1 hour of reading the web, I discovered that the problem is do to software and not do to hardware. Those of you that are using fdisk to see ( and/or partition) this disk will run in the same issue. So I used “parted” in command line. I did not tested with Gparted ( from live Ubuntu distro) but I assume that will work also. So I used the last Parted version and the disk size was ok 3.001TB. 1: you have to change the partition table from msdos to gpt. 3: then you must format the new partition to the ext2, ext3, ext4 or whatever you want. This step may take few minutes. Wait…. Probably there are other ( more easy or cleaver ) methods but this was working for me.